Happy Friday! I'm pretty sure I wore this above outfit almost every day at home this week because it was so comfortable to throw on and sit at my desk. 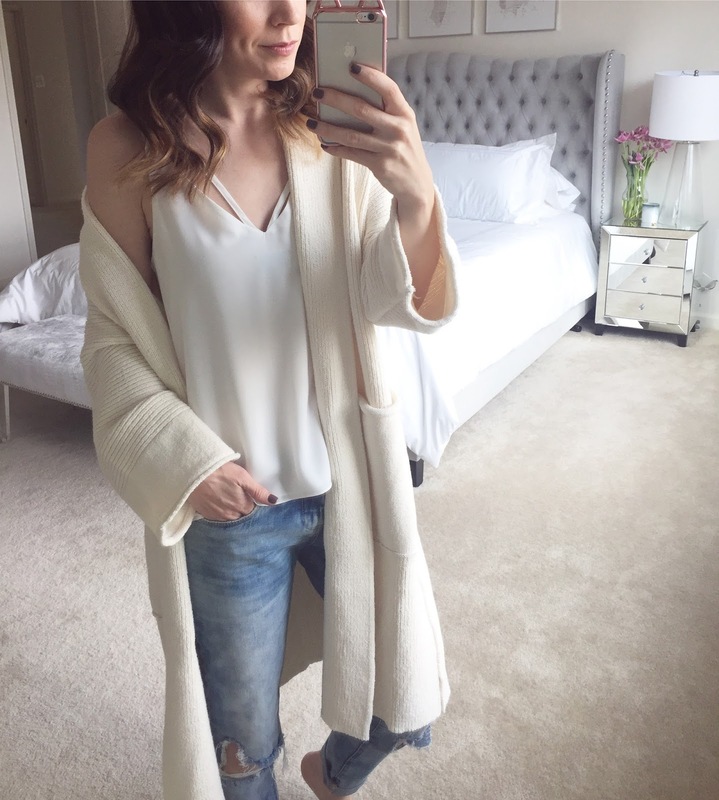 Here are links to the cardigan, tank and jeans for this look. We are now officially in winter limbo it feels like while we wait out the cold weather in anticipation of spring! And in honor of my excitement that winter will soon be behind me, most of the finds this week are spring related. 1. Zara has been catching my eye a ton lately. Here are some of my favorite pieces currently on their site: these camo jeans, this printed blouse, these high rise jeans and this dress is a tad pricey for Zara but the print and collar are so stunning! 2. I talked about this stick in my recent What's New video and while it really did a great job of blurring my pores (it instantly made them look minimized), it's not something I see myself using. I tried it under my foundation and I didn't notice enough of a difference to make it a permanent part of my daily makeup look. 3. Camisoles and tanks are a staple in my closet - this satin one has a gorgeous delicate shape and the striped pattern of this one makes it a nice addition under a black suit or blazer. 4. This off the shoulder top that I wore last summer is back this year! It's a great style and an amazing dupe for this designer version. The chambray one is really calling my name for this spring. 5. Tops with a criss-crossed neckline are everywhere right now. This one is under $30, this one is a great top for Spring, this one is a great everyday staple and this one is another option under $30. 6. Now that I am working out regularly again, I have become focused on finding cute workout wear. I am already in love with these leggings which I recently wore on Instagram, but found some other cute styles out now as well. These moto leggings have the most amazing palm print, the reviews seem really positive on this sports bra (which is only $15!) and these Nikes are next on my list to buy (narrowing down a color is the hard part lol). 7. A friend of mine has this journal and recommended it to me. It's a more structured way of utilizing a gratitude journal. I've tried a regular notebook, but I like that there are different sections per day to write down intentions, affirmations, etc. 8. Valentine's Day is right around the corner and if you need some fun ideas for cute gift items, I saw some adorable ones on the novelty section of Nordstrom. These gummy candies are some of the best I've ever had, this jewelry box is adorable and I love the writing on this vase. I rounded up a few other items that caught my eye in the widget below.